This is the first model that I made in my re-acquaintance to the art. 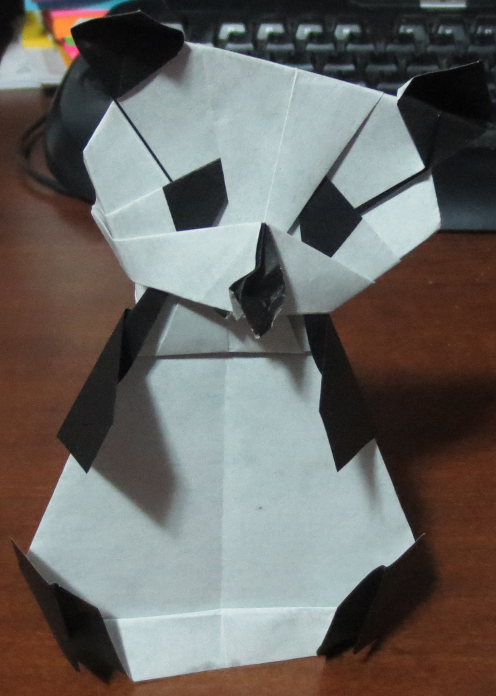 I have always liked Pandas and the model had come up in the discussions that I mentioned in the Origami Penguin post. This one took me longer and a lot more rewinding. I found it tougher that the penguin but that also may be because it was the first that I had done in quite some time. Happy: 10/10 I love this model. It is so cute and captures the essence of a panda perfectly. Relaxed: 7/10 I did a lot of rewinding and made a few miss-folds that fortunately did not effect the end result. Intellectual: 9/10 It brought back memories and terms that I had forgotten. It was also challenging to build.